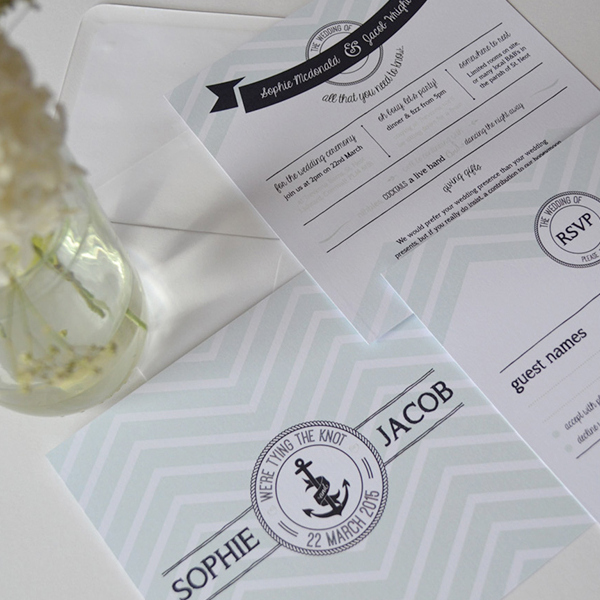 You don’t need to be a sea-faring couple to enjoy a nautical theme for your wedding but the Oh Bouy wedding invitation is the ideal couple who have a romantic story that involves the sea. You could have met in a seaside resort, you could enjoy holidays by the beach or you may be hosting your special day by the water or even on a boat. No matter the reason for adding a ship-shape design to your special day, the look and feel of the invitation will go down well with everyone. The anchor design may be the eye-catching element of the invitation but the breaking waves at the top of the bottom of the card and inserts are a classic addition that really adds a touch of elegance and class to the overall look of the invitation. Elsewhere, simplicity is the key for this invitation with the focus falling on the happy couple and the information that they are looking to share. If you want to provide a stylish wedding invitation that provides everything your guests need to know, this is going to be the perfect invitation. As you would expect from a water based theme, greens and blues are well represented with the mixture of mint and dark blue setting the invitation off nicely. There is also a pink option if you are looking for something lighter and this also works very well with mint. The Oh Bouy! design is available in a range of stationery from Anon Designs and on the day products so no matter how strongly you want to introduce this theme to your big day, you’ll find that this collection is the ideal way to do so. This is a fresh and original style of wedding invitation that will be the perfect way for many couples to set sail on many happy years together. Tags: Anchor, Mint Green, Nautical, Seaside.